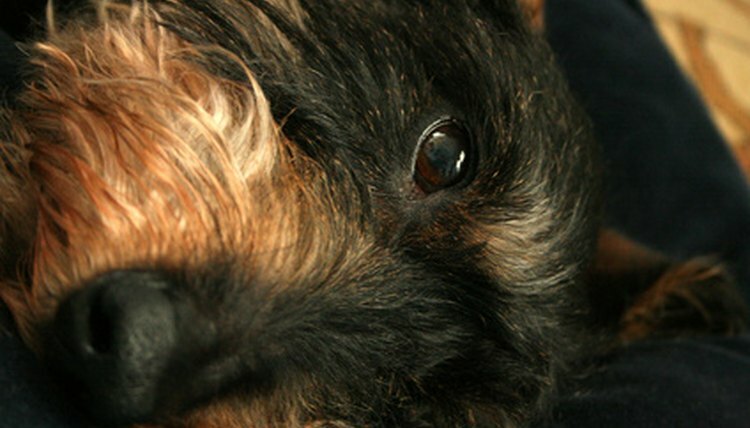 Organ bruising or damage in your dog is serious but not always incurable. Like humans, the extent of the bruising determines the severity of your dog’s condition. For example, a surface bruise that your dog sustains after roughhousing near the sharp ledge of a table is less traumatic than when a gallon of paint falls off the roof and lands directly on your dog’s hindquarters. According to researchers at the University of Missouri, the symptoms of kidney trauma in dogs and cats mirror the symptoms of humans with kidney injuries. Without proper treatment, kidney injuries can be fatal. Take your dog to the vet immediately if you suspect that his kidneys are bruised, damaged or malfunctioning. Your dog’s kidneys are located on his back, above the base of his tail. Bruised kidneys make this entire area sensitive to touching and petting. Your dog will pull away, whimper or arch his rear when you try scratching his lower back. Other indications of sensitive tissue include not rolling on his back and refusing to rest on his side. He will also exhibit obvious discomfort by yelping or wincing when the vet applies pressure. Any change in your dog’s urine output, odor or consistency can indicate kidney trauma. Kidneys filter and pass urine to the bladder. A bruise causes bleeding in the surrounding tissue. In the case of a bruised kidney, the blood leaks into the kidney tissue and turns your dog’s urine black or reddish-orange. Even a little blood in your dog’s urine is unsafe and indicates serious injury. Don’t wait until his urine is pure blood to seek veterinary help. The location of the bruise on the kidney affects the change in urine production. Different injury locations produce different effects. A bruised kidney can increase your dog’s urine production, which causes excessive thirst. A bruise of a different shape, with a different impact point that severely damages an entire section of tissue, can cause your dog to chronically leak urine or severely reduce his ability to process and pass urine. Both scenarios are serious and require immediate medical attention. Kidneys are the body’s filtration system for toxins and nutrients. A dog with bruised or damaged kidneys can’t properly filter his blood, causing him to feel tired, listless and depressed. His reduced energy is partially from the pain of a damaged kidney, but also because bruised kidneys can’t process blood as quickly as healthy kidneys. This is why blood work is one of the first tests veterinarians perform on dogs with suspected kidney injuries, bruising or damage. The results will alert you and your vet to any red flags in his blood levels that indicate infection or reduced kidney function.